Last night we had a Halloween party with some of our friends who also homeschool. The kids all came in costumes and looked adorable. We played some games, read a story, did a craft and ate LOTS of food! For those of you who know me, I am not a fan of Halloween but as long as it doesn’t involve trick or treating – I will compromise so the girls can join the fun of dressing up. There were 12 kids 6 and under – it was crazy and fun all at the same time!! The kids get along remarkably well! I didn’t take many pictures – oops. Luckily, our friend (and one of the dads), Will, is a photographer so he took tons of great pictures! I made Daphne’s tutu yesterday. 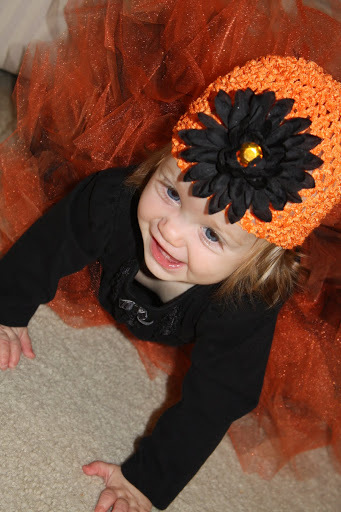 It was so fun and easy – Norah and Lucy may need tutus, too!! Our little friend, Jack. He is so sweet with the babies! Daphne turned 9 months on October 17th – I know, I’m a little late. . . .again! She had a doctor’s appt. last Friday and she weighs 15 pounds, 10 ounces. I know, she is a little thing. That puts her in about the 8th percentile. Her length is about 75 percentile and her head is the 40th – both of those have stayed consistent. I mentioned to the doctor that Daphne is a horrible bottle drinker. We are lucky to get 20 ounces of formula in her in a day – the doctor would prefer 24, but she isn’t too concerned yet. We are supposed to be feeding her high fat foods – cheeses, yogurt, and egg yolks. She also said to add butter to anything we can – never thought I would be forced to give any of my kids butter! Ha! Daphne is still babbling like crazy! She has now figured out how to be louder than her sisters – it’s lovely, really (note the sarcasm). She screeches and squeals frequently! Norah and Lucy will be running in a big circle on the main level of the house and Daphne tries to follow them, crawling as fast as she can. All 3 girls will be screeching and squealing at the same time – I don’t think Kevin realized little girl voices to be so high and loud at the same time. Daphne is cruising of furniture and climbing on EVERYTHING!! Nothing safe anymore – Norah and Lucy get very frustrated when Daphne gets into their toys. Daphne seems to be a little drama queen already (really, can I handle another one?). She had just started doing this pouty face thing several minutes before she cries. Her bottom lip comes out and her chin gets all wrinkled. She looks like maybe she is trying not to cry and then all of the sudden she wails and buries her head. It is pitiful. When she first started it, we were at my mom’s and my mom and I thought something was wrong. Now, I really think she has figured out how to get attention. If I act like I am not looking, she doesn’t even cry. If she catches my eye, the pouty face begins!! I love this blog and now her new one too! One suggestion recently was to have your child write a list poem. My friend, Sarah, had her daughter write one today and Norah wrote hers today, too! Just for the record, we are not moving in the foreseeable future! A Camping We Will Go . . . Again? Alright, if you have been reading my blog for awhile or you know me well, you know that I don’t love to camp. I do it occasionally because Kevin likes it so much. We went camping about a year ago (well, actually, Lucy and I slept at home – I was 7 months pregnant and was not about to sleep in a tent). Then we went camping again this summer for Father’s Day. In early August, Kevin started talking about camping again . . . this year! Ummm, I don’t think so. Daphne struggled with her sleeping and I just didn’t want to do that again. Once she was asleep, she was fine, but she had a hard time falling asleep and I just didn’t want to go through the stress of her waking everyone else up in the campground! Kevin asked me if I would consider going if we stayed in a cabin. I think my response was something like, “I guess I could consider it.” Well, that was all the okay Kevin needed. He made reservations that day for last weekend! His parents are big campers so we invited them to go with us – the cabin sleeps 8. We went last weekend to Klondike Park. The cabin was really nice – but it would have been even nicer with a kitchen and a bathroom – ha! The weekend ended up being pretty cool – especially once the sun went down. Daphne REALLY struggled while we were there. She didn’t take ANY normal naps. She slept occasionally in the the little hiking backpack thing, but really didn’t want to sleep in the pack n play in the cabin. Friday night we put her to bed – lots of rocking, swaying, singing, but about 9:30 she woke up screaming. I calmed her down and put her back in bed. More screaming. I tried putting her in bed with me – she was fine for a little while, but not sleeping. Then she started crying and she cried and cried. Kevin and I finally decided I should take her home – we really didn’t want to risk keeping the big girls up ALL night. We were just about 30 minutes from home so I drove her home – slept in my bed in my nice warm house!! Daphne and I headed back first thing Saturday morning. Norah and Lucy seemed to sleep well and we excited to eat pumpkin pancakes for breakfast! We were busy all day hiking, playing, and running around. If you live in the St. Louis area and you have never been to Klondike Park, you should go. It is really nice! The trails are nice and they also have paved paths – we took the girls bikes so these paths were perfect! The girls totally wore grandma and grandpa out with all their walking and running and bike riding. Seriously, Norah could hike FOREVER!! I took Daphne home again Saturday night and Kevin, his parents, and the girls headed home mid-morning on Sunday. Me: Lucy, you don’t like juice. Lucy: Yes I do, I want juice. Lucy: No, I want juice. I will really drink it this time. Me: Lucy, I told you to drink your juice first. Lucy: But I don’t like juice! Me: If you want milk, drink your juice first. Lucy: (through tears) I’m drinking my juice. Now can I have milk? Lucy: (in a WHINY voice) but I wanted more juice!